In continuation to our earlier two educational posts on early human’s life this article includes some exciting inventions by early humans. Parents should provide printout of this post to their kids for enhancing their knowledge about our ancestors. In our previous two articles on Early human's life educational series, we described how early humans started to live in caves rather than wandering in jungle to save themselves from wild animals. With time, they settled near river banks for seeking better living environment. They also discovered fire and tools that made their life better than earlier and no doubt discovery of farming was a big leap towards civilization. 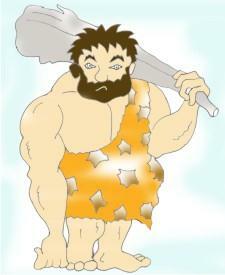 Along with farming, early humans also started taming useful animals like hen, goats, cows, sheep and dog. With time, they started using these animals for different types of works. They used some animals for getting food like milk and eggs and some of them were useful for cartage and farming. They started using bullocks to plough the field and dogs for hunting and security from wild animals. Earlier they used to pull heavy loads their selves but now they started using domestic animals to do so. Thus, with such improvements, the life of early humans became much better. 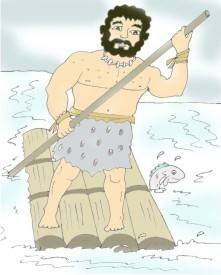 It is believed that early humans would have learnt to travel on water before invention of wheel. While living close to the river early humans noticed some logs of wood floating on water. This gave them idea for sailing in water and they tied some logs together, making a raft that helped them to travel by water. This was quite helpful to go middle of the deep river for fishing. Before invention of wheel, early man has to walk on foot. They would move to walking distance areas only. They generally used tamed animals for riding to covering longer distances with very less goods. They lived in small groups in different places. Before invention of wheel, these small groups would remain isolated from other groups. Later they started to carry their burden on flat pieces of wood. One day one of them noticed a stone rolling down the hill. It stroked an idea in his mind. He thought a rounded shaped object can roll more easily on earth surface thus it was the first time when an idea of wheel came in existence. First of all, he tried to make a stone wheel. He tried to chip the big stone in a round shape for making wheel. But making hole in stone to use is as a wheel was a tough job. Later he got idea to use wide stem of the trees as a wheel and got succeeded. This was a revolution in early man life. Now he could easily make wheels with holes inside for joining the two. Later he made cart that could be carried by a bullock. 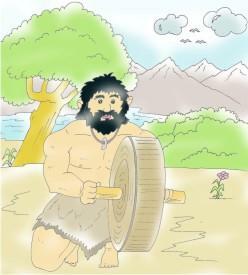 Thus invention of wheel had changed the early man life, entirely. It is well said that "the necessity is the mother of invention". The time and basic necessity taught early humans to find and invent new things. This made their brain more developed and matured. Now, instead of wandering alone he was living with his family in a small community. They were doing farming, taming animals, using fire for cooking food and making tools, riding on wheels carts and moving towards a civilized society, hand in hand. So kids, how did you find this journey of early humans life from an entirely isolated tough wild-life to a civilized society? 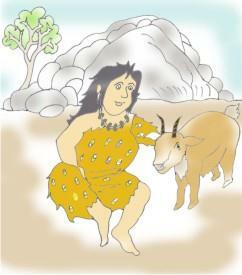 Tell this early humans story to your friends also and do send us your feedback for this article.